Should I Bother With an Outdoor Digital Signage Enclosure? 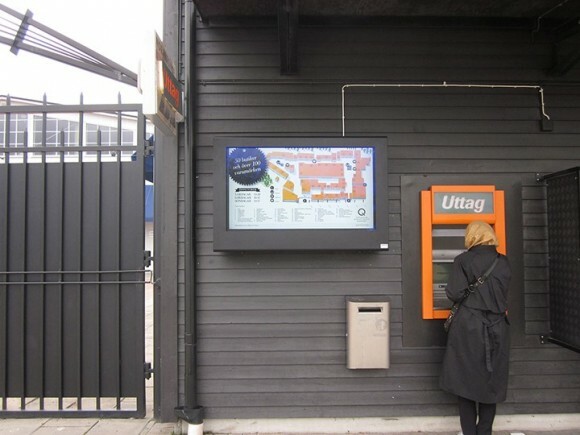 Outdoor Digital Signage: Should You Bother With a Digital Signage Enclosure? Last updated on September 21, 2015 October 20, 2015 by Daniel Waldron for Armagard Ltd. Imagine your car without a chassis [if you don’t drive, a bus, train or private jet will suffice]. You’ve got wheels, an engine, a steering wheel and all the electronics, everything you need to make the car work. However, all the vital components of your car are even more vulnerable than usual, exposed to threats such as weather damage and theft. Thankfully, you’ve got car insurance and you can get the chassis replaced and your vehicle is once again, secure. With an outdoor digital signage enclosure, the sooner you can see past it as ‘another cost’ and see it as an ‘insurance policy’, the sooner you can understand why it’s crucial to enclose your outdoor digital signage system. Why bother with a digital signage enclosure? Have a think about what you already have protected in your life. We’ve established that you’ve got car insurance, you could even have home insurance, life insurance, and chances are you’ve even got a protective case for your smartphone. The point is, on a personal level you’re taking steps to protect what’s important to you, so why should it be different for your outdoor digital signage system? The truth is, just one act of vandalism, the theft of a screen or a month’s worth of rainfall in a day leaves your exposed, outdoor digital signage system out of commission. Why take the risk? For the sake of spending a little extra on an outdoor digital signage enclosure, you will save thousands in the future. Enclosing equals protection and reassurance. However, enclosing your outdoor digital signage system is not all about protecting your expensive equipment from external threats, an enclosure also defends digital signage against itself. One of the concerns among patrons of digital signage is a system’s ability to withstand heat in hot climates. By itself, a standard digital screen cannot survive in scorching heat, any internal fans are working overtime to the point that they fail and eventually the entire screen suffers burnout. Armagard enclosures are built to withstand outdoor temperatures. However, introduce an enclosure and you’ve got a ready-made cooling system that enables an outdoor digital signage system to operate at an optimum temperature. It’s no exaggeration that an enclosure can expand the lifespan of a screen beyond the shelf life specified in the manufacturer’s manual. Honestly, what would you say are your biggest barriers to enclosing your digital signage system[s]? It’s fine to have objections, provided you can justify them. Let’s tackle your issue with cost! Compared with buying a dedicated digital screen for use outdoors, the cost of an enclosure can be up to 50% less, instantly you make a saving. However, it’s the long-term costs where you will really save. For instance, a purpose-built outdoor screen comes with one fundamental flaw. Should it cease to work and the warranty has expired, the cost of repair or replacement falls on you and this becomes an expensive hobby for your business because ultimately a screen will fail, eventually. Now, take an enclosure. If a screen stops working, you don’t have to replace the enclosure. You can replace the equipment within by sourcing it at a price to suit you, there are no expensive maintenance costs involved. Wait, there’s more. The added bonus is flexibility. If a screen in an enclosure stops working, you can replace it on the same day. This proves to be a bit more of a challenge when replacing a specialist, dedicated outdoor screen. Tackling the image issues, yes, we’ll agree that enclosures can carry a stigma. There are ‘manufacturers’ in this industry that do produce ‘cheap’ replicas. However, the few should not tarnish your view of those who manufacturer quality enclosures. 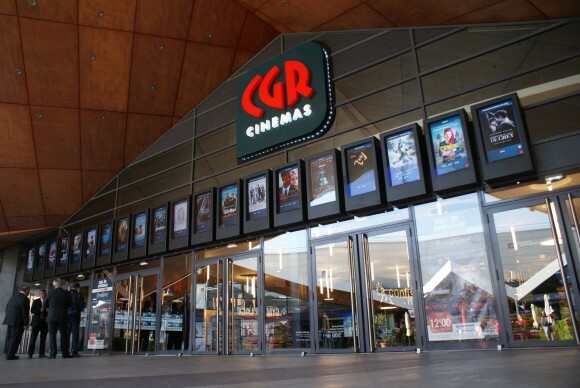 This cinema entrance is brought to life by screens housed in Armagard LCD enclosures. 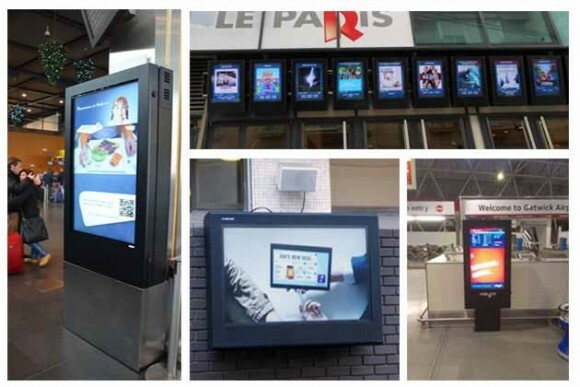 Now, forget about your outdoor digital signage network for a moment, there’s a far more immediate problem, your business reputation. People talk, and nothing will unravel your business more than word of mouth. Before you know it, news of your ‘inactive digital screens’ will have spread across social media, for instance, and your digital signage will be talked about for all the wrong reasons. Then, to top it off, your competitors hear about your digital signage misery. Suddenly, your business finds itself on the back foot and your outdoor screens become a source of embarrassment and distraction as you end up focusing on fixing the problems. You see, enclosures can do far more than safeguard your screens, they protect your business reputation and allow you to establish a real digital signage presence. Ultimately, this is the primary answer as to why you should enclose your digital signage network. Armagard enclosures are capable of lasting up to 10 years or even more. Enclosures go beyond 10 years of protection for your screens, they give you 10 years to establish a strong digital signage presence. Minimal maintenance, reduced costs, flexibility and longevity, mean enclosures are great value for money, therefore they should not be dismissed as an option. Don’t let your digital signage fail at the first hurdle, factor in enclosure protection at the planning stage. For further insight into enclosure protection for your digital screens, call us on 0121 608 7226. If you’d prefer a call from us, please complete the onscreen, ‘Quick Enquiry’ form.